De'Longhi KBOV 3001. Box Contains. 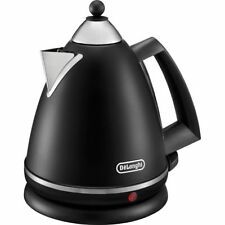 DeLonghi Avvolta KBA3001.W 3000W 1.7L Cordless Kettle - Black. Ex display absolutely no marks very quick boil, grab yourself a bargain. some slight lime scale marking(very slight inside) No warranty as private seller but all paper work including warranty form included. Box good condition a few scuffs. The 1.7 litre capacity allows all your family and friends to enjoy a hot cup of coffee together while you catch up. 1.7 litre capacity. Feature 1: Capacity: 1.7 litre. Type: Kettle. Colour: Black. Large Screen orders will only be attempted on one occasion. De'Longhi KBX3016.BG 1.7L 3kW Argento Flora Kettle - Beige. 5 out of 5 stars - De'Longhi KBX3016.BG 1.7L 3kW Argento Flora Kettle - Beige. 2 product ratings2 product ratings - De'Longhi KBX3016.BG 1.7L 3kW Argento Flora Kettle - Beige. With an anti-scale filter, 360° swivel base and generous capacity, the hard-wearing stainless steel kettle is functional as well as fashionable. Ideal for left and right handed users, the kettle has a 360° swivel base and an ergonomic rounded handle for comfortable operation. 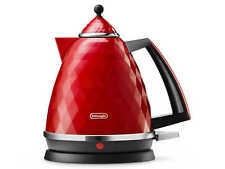 This stylish cordless kettle has a 1.7 litre capacity making it perfect for a large family. 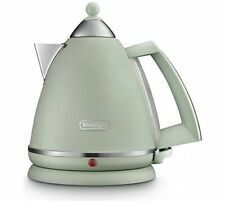 FOR SALE - - De'Longhi Argento Flora Kettle (Green). In Perfect Working Order. NOTE: Marks round the mouth/spout of the kettle as shown on pictures. NOTE: RRP price in Argos and John Lewis £59.99. With an anti-scale filter, 360° swivel base, generous capacity and auto-shutoff when boiled or lifted from the base, the hard-wearing kettle is functional as well as fashionable. Ideal for left and right handed users, the kettle has a 360° swivel base and a large ergonomic handle for comfortable operation. The 360 Degree Swivel Base and Rear View Water Window allows you to use the Kettle with either hand. The De'Longhi Kettle also has 2 built in safety Functions, Auto Shut Off and Thermal Cut Off, so you can have peace of mind when your not using it. De'longhi Micalite Icona Kbom 3001. W Kettle 1.7 Litre White. The kettle is in good condition. No manual or box included in this sale. Isle of Man : IM. Channel Islands : GE-JE. Isle of Wight : PO30-PO41. Alderney, Herm & Sark : GY9. De'Longhi KBX3016.AZ 3kW 1.7L Argento Flora Kettle - Blue. Base Colour : White. Full Colour : White. Capacity in L : 1.7L. 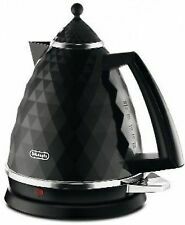 Delonghi Active Line 1.7L Kettle Black Ref: KBLA3001BKThis stylish Delonghi Active Line Kettle has a black plastic body with an attractive stainless steel band around its base. This Delonghi kettle also features a removable and washable anti-scale filter. Used in excellent like new condition. Also Known As: Spout Filter. The KBX3016.C Argento has a new silver inset handle and water window. It features a 360° base for both left- and right-handed use and neon power indicators on both sides. With non-slip feet and cord storage, the De'Longhi Argento will be as attractive in your kitchen workspace as it is easy to use. Kettle with 1.7 lt capacity and a painted stainless steel body. ANTI-SCALE FILTER. SWIVEL BASE. 3000 Watt power output. Anti-scale filter improves the quality of your drinks. 360 degree connection for left or right handed use. De'Longhi Argento Flora 3kW 1.7L Cordless Kettle & 4 Slice Toaster Set - Green. 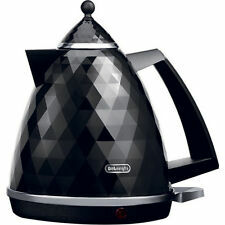 De'Longhi KBX3016.PK 3kW 1.7L Cordless Argento Flora Kettle - Green. De'Longhi CTO4 Argento Flora 4 Slice Toaster - Green. • Boil dry protection - automatically switches off when the kettle is empty. 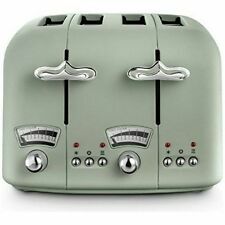 4.5 out of 5 stars - De'Longhi Argento Flora 3kW 1.7L Cordless Kettle & 4 Slice Toaster Set - Green. 4 product ratings4 product ratings - De'Longhi Argento Flora 3kW 1.7L Cordless Kettle & 4 Slice Toaster Set - Green. Stylish traditional kettle. 3 level saftey protection. 360 degree swival base. Very little use less than 3 weeks. wife now wants RED. We have red and White Kitchen. where to you stop guys. Zone 1 - England, Wales and parts of Scotland, excluding Highlands and Islands. There's no need to wait for your hot drink of choice when you have the stylish grey De'LonghiScultura KBZ3001GY Jug Kettle. With ample capacity of 1.5 litres, ensure you're always able to brew up a quick cup of tea when the situation demands, with the grey De'LonghiScultura KBZ3001 Jug Kettle. 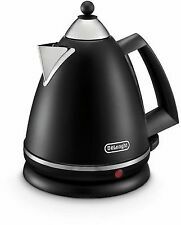 Beautiful DeLonghi Distinta KB13001.BK Kettle in Black - Fully Operational!